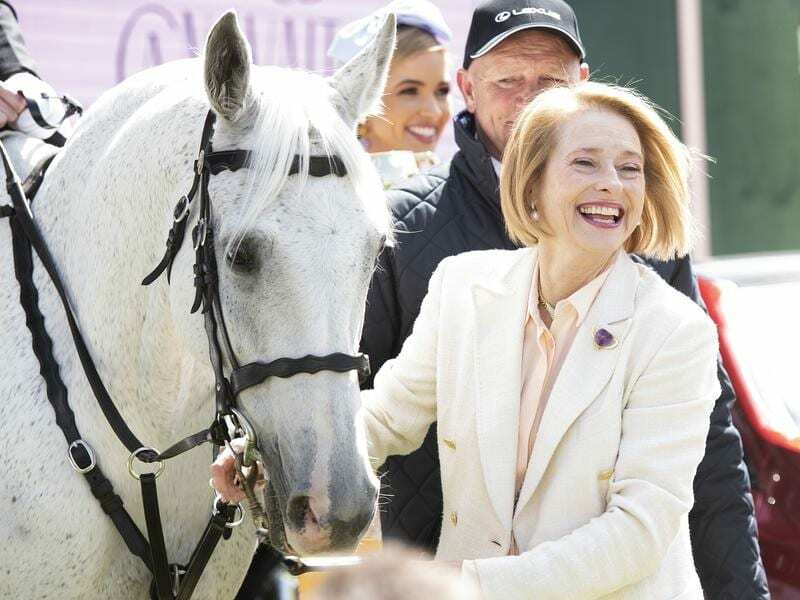 Australia’s queen of racing Gai Waterhouse doesn’t want to hold the 2018 Melbourne Cup just yet. But come Tuesday afternoon, Waterhouse and some of the biggest names in world racing will gladly put their hands around the 18-carat gold Cup. Tens of thousands of people are expected to line Melbourne’s Swanston Street on Monday to catch a glimpse of the coveted Cup in the annual Melbourne Cup parade. Waterhouse will again feature in the parade along with a number of trainers and jockeys involved with this year’s Cup runners. Melbourne lord mayor Sally Capp and Victoria Racing Club chairman Amanda Elliott will carry the $200,000 Cup during the parade, before it is handed to the winning owner after Tuesday’s $7.3 million race. Waterhouse, who won the Cup in 2013 with Fiorente, passed on the chance to hold this year’s trophy during an event at her Flemington stable on Sunday. “I don’t hold the Cup until we win it, but there it is,” she said. Waterhouse said the Melbourne Cup is always a hard race to win. If the bookies are to be believed, Yucatan is set to add to retired Melbourne businessman Lloyd Williams’ record haul of six Cups. Son and fellow owner Nick Williams talked up the internationalisation of ‘the race that stops a nation’ 25 years after Irish-trained Vintage Crop’s win put the race on the world stage. “It’s getting close to being the race that stops the world,” he said. He pointed to some of the big names who own horses in this year’s race: Saudi Prince Khalid Abdullah, Dubai ruler Sheikh Mohammed and his brother Sheikh Hamdan, and the Magnier and Niarchos families. “There’s not many bigger names in racing in the world.